First Line: The middle-aged victim slumped dead in his Barcalounger, one trouser cuff riding up over his snow-white ankle and his zipper splayed open like he expected a happy ending. It's been ten years since a series of unsolved mysteries rocked Cheyenne, Wyoming, and an ambitious television reporter thinks uncovering the identity of the killer will be her ticket to the big time. She enlists the help of retired detective Arn Anderson, who spent more than thirty years in the Denver Police Department. When he gets there, Arn doesn't have money to burn, so he moves into the now-derelict family home and starts fixing it up when he's got the time. He's getting nothing but grief from the Cheyenne Police Department, but that's going to change. Because the Five Point Killer doesn't want to be found, and he'll do whatever it takes to remain in the shadows. I first became aware of C.M. Wendelboe's writing through his Spirit Road trilogy of mysteries set on the Pine Ridge Reservation in South Dakota. I enjoyed all three books and was sad to see the series end. When I learned of this new Bitter Wind series, I couldn't wait to start reading. Arn Anderson is yet another example of Wendelboe's gift of creating strong characters. He's been a widower for years and has yet to look at another woman. He's just not ready, and-- who knows?-- he may never be ready. He's persistent and has an eye for the telling detail, which finally has him breathing down the neck of the Five Point Killer. It's a pleasure watching this man put clues together. But it's in Arn's personal relationships where he really shines (and where Wendelboe shows his marvelous sense of humor). Arn tries to act tough and hard-hearted, but he's not. All you have to do is watch him with Danny, the homeless man who had moved into Arn's rundown house for the winter. 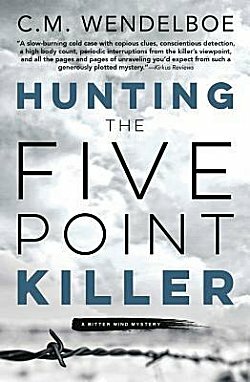 As I read, it occurred to me that there was only one person who could be the Five Point Killer, and Wendelboe did everything in his power to shake me loose... but it didn't work. And it didn't matter. I enjoy Wendelboe's writing, his sense of humor, the way he has his story unfold-- and the man certainly knows how to ratchet up the suspense. His writing is reminiscent of Craig Johnson's, which is one reason why I like it so much. Yes, I do like his writing, but this book could've been better. It did need to be tightened up a bit because there were places where the story dragged, but I'm going to go off the reservation here and talk about a couple of things that Wendelboe had no control over. One: the print in the paperback edition is tiny. I finally gave up and bought a digital copy (which shows you how much I was enjoying the story). Two: the proofreaders really let the man down. "Loped" instead of "lopped." "Bitty" instead of "biddy." "Lose" instead of "loose." And-- most surprising-- "neckless" instead of "necklace." (And, no, that wasn't a complete list.) I'm used to reading advance reader's copies of books that do contain errors but to have a finished edition be this poorly done was a shock. Is this going to dissuade me from reading the next Bitter Wind mystery? Absolutely not. But one can always hope the editing has vastly improved. Thanks for your insight. I'm sure Curt is aware of the proofreading problems and has already taken the steps to insure it doesn't happen again. Even though I hate those kinds of mistakes also, I'm off to find a copy. Someone on Facebook told me to send Curt a copy of my review, and I told her that he already knew. I don't know how many times authors at The Poisoned Pen have told us that they're forever getting complaint emails about errors, even when the books were published years ago. I know their print is usually pretty small, but, Kay, they managed to reach a brand-new low-- from pretty small to absolutely tiny. Boy howdy!!! I'm glad you enjoyed the story, Cathy. And the setting and atmosphere really appeal to me - I may have to try this series. That said, though, I'm sorry to hear the book wasn't proofed properly. Those details really do matter. A lot. Yes, they do, because they keep jerking readers out of the story. The lose/loose and neckless/necklace ones were like getting slapped upside the head with a brick each and every time. Ouch!